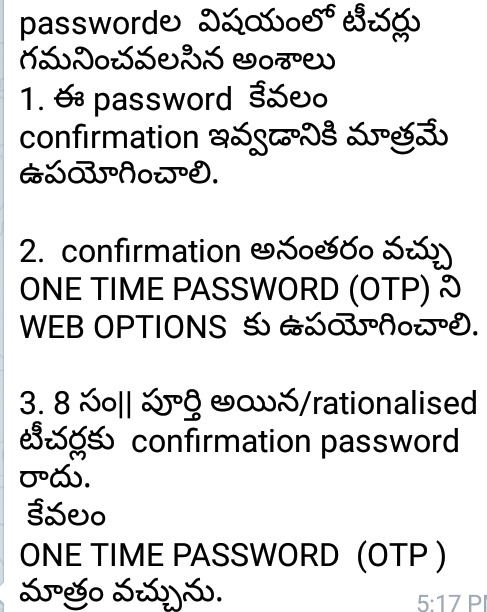 Confirm Online Transfers Application Form, AP Teachers Transfers orders. Teachers Transfers 2017 in Andra Pradesh started June 2017 as per GO 63 Guidelines issued .Teachers Transfers Guidelines who are willing candidates Apply online application and Rationalization & 8 years Completed Teachers and 5 years Completed Head Masters Apply compulsory . After Online applications submitted Calculate Service and performance Entitelment Points . Seniority list prepared based on Entitelment Points . Teachers District Seniority list available at School Education Official website cse.ap.gov.in check Teachers Seniority list display on 30-09-2017 or 01-10-2017. Applied Teachers must confirm Transfers online application . Who are not confirm , not interested to Transfers or not willing . Confirmation Dates 01-10-2017 and 02-10-2017www.cse.ap.gov.in for confirmation Official website. Applied Candidates web Option in online through http//cse.ap.gov.in . wep Option time find Vacancies near by Schools list useful to web Option Steps . Near by Schools list find in GIS . This final step in Teachers Transfers online application. So very careful to click web Option. Know your School code UDISE codes Useful Option time. 7. After verifying the options only click submit. A preview will be generated then and Next Confirmation button click. It's only for request transfers For long standing & Rationlised tchrs haven't pasword for Confirmation. 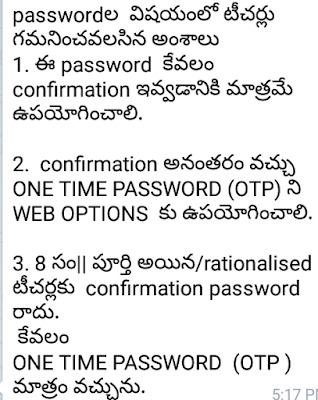 After Confirmation One Time Password (OTP) 04-10-2017 come to all teachers to give Web Options.